Alphabet Inc. (GOOG) the holding company of a little brand called Google has rolled out a Fact Check feature to combat the current surge of fake news. This is Google's first attempt at tackling the problem through changes to its search algorithm. While last year, the company changed policies for its AdSense platform to ban fake news publishers. If a Google Search query has been checked by a credible source, then it will display a link to that source along with the words "fact check" on its results page. Note that not all search results will have fact checks. 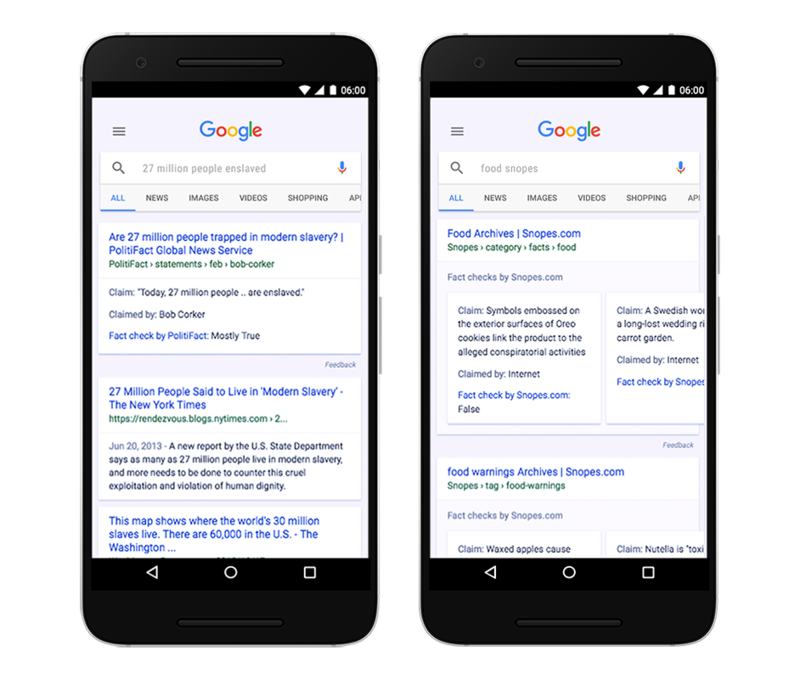 In its efforts to be seen as fair and impartial, Google will also display competing claims on the same page. "Even though differing conclusions may be presented, we think it's still helpful for people to understand the degree of consensus around a particular claim and have clear information on which sources agree," the company wrote in a blog post on its site, adding that its audience would have "an easier time reviewing and assessing these fact checks, and making their own informed opinion." Along with Facebook, Inc, Google was in the eye of a fake news storm that ensued after last year's US presidential elections. Journalists accused both sites of being a hub for fake news results pertaining to elections. Facebook is said to be using artificial intelligence to weed out fake news from its platform. The company said it would display news publishers and sources in its news feed after several incidents surfaced last year that showed how fake news sites use its network to propagate false information. However, both companies have stopped short of owning responsibility for information on their platform. In that sense, Google's update today, which displays competing claims without favour, is reflective of that line of thinking. While discussing Facebook's efforts to curtail fake news, Facebook CEO Mark Zuckerberg cautioned that the company should be wary of "becoming arbiters of truth ourselves." These new precautions have their merits and while it won't completely stop the spread of fake news it will encourage users to be more vigilant before sharing questionable content from dodgy sources. The popularity of fake news ultimately still lies in the response from the individual. So please fact check before you share anything about Mr Bean again. What do you think about Google and Facebooks attempt to kerb the spread of fake news? Do you think they should take more responsibility? Let us know what you think in the comments section below.